Time to take on another epic cake. I've been pouring through the pages of this book I borrowed from the library and trying to settle on a recipe that strikes my fancy. Now it isn't going to be a monumental effort like last year's Opera Cake, but it should be rich, decadent and boozy. And why not? Boozy, I mean? Liqueurs really take the flavor of an already fabulous recipe to new heights. With this baby, it will be cognac. And neither have I baked with it, nor had a sip of it prior to this day. But it was the spirit of choice for the cake. 2. 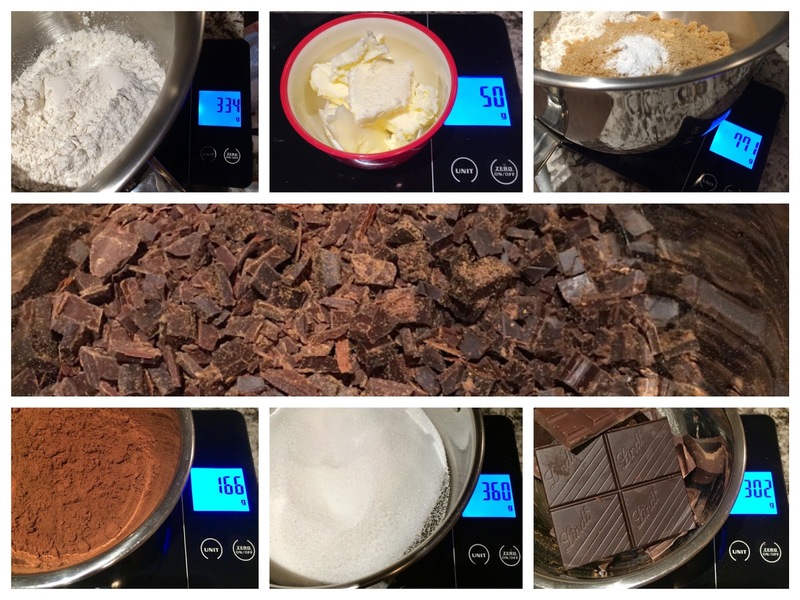 In a medium bowl, whisk chocolate, cocoa and hot coffee until smooth. 3. Cover with plastic wrap to prevent evaporation and cool to room temperature. 4. 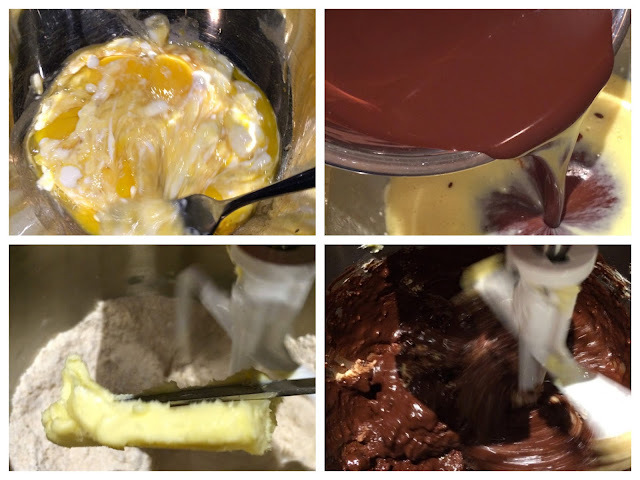 In another bowl, whisk the eggs and yolks, sour cream, vanilla and half of the cooled chocolate mixture from above. 5. Now's a good time to preheat the oven to 350F or 175C. 6. In the bowl of a stand mixer fitted with the beater, mix the dry ingredients to combine, on the lowest speed for about 1 minute. 7. Add the softened butter and mix until the ingredients are moistened. Then raise the speed and beat for 1 minute. 8. Add half of the egg mixture, turning off the mixer, then slowly increasing the speed to incorporate, about a minute. Repeat with the other half of the egg mixture, making sure to scrape the sides of the bowl. 9. Divide the batter into the 3 pans and bake for 40 to 45 minutes in the center of the oven, if possible on the same rack. Make sure to rotate their positions after the cakes have risen. 10. When it passes the skewer test, let cool on wire rack for 10 minutes before inverting into the rack itself to cool completely. 11. When cool, brush the sugar and cognac syrup on the top and sides of each layer. If preparing the cakes for the day after, wrap the cakes tightly in plastic wrap twice, and freeze for easier frosting. 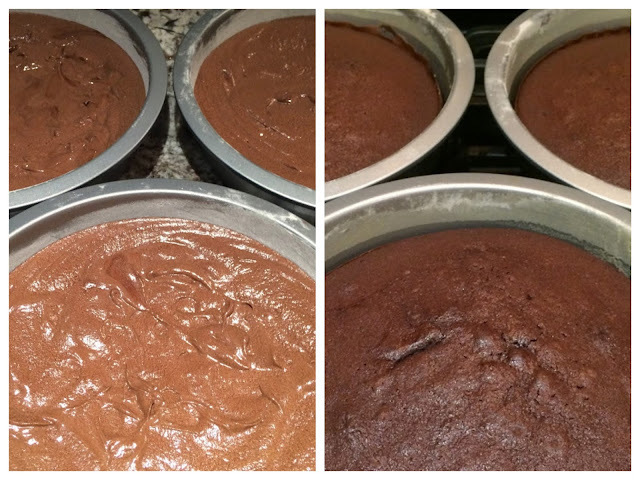 Remove from freezer 15-20 minutes before composing the cake so it will still be on the firm side. Directions:1. In a medium bowl, whisk the cocoa and hot coffee until smooth. When slightly cooled, add the vanilla and cognac, then set aside. 2. Either grate or process the chocolate in the food processor and place in another bowl. I just cut it into shards with a knife. 3. In a medium sized heavy saucepan, swirl together the sugar and water until sugar is moistened. With the heat on medium high, stir until the syrup starts to bubble. 4. Stop stirring, reduce the heat to medium and allow the syrup to boil until it turns into caramel. 5. A candy thermometer is handy at this point. 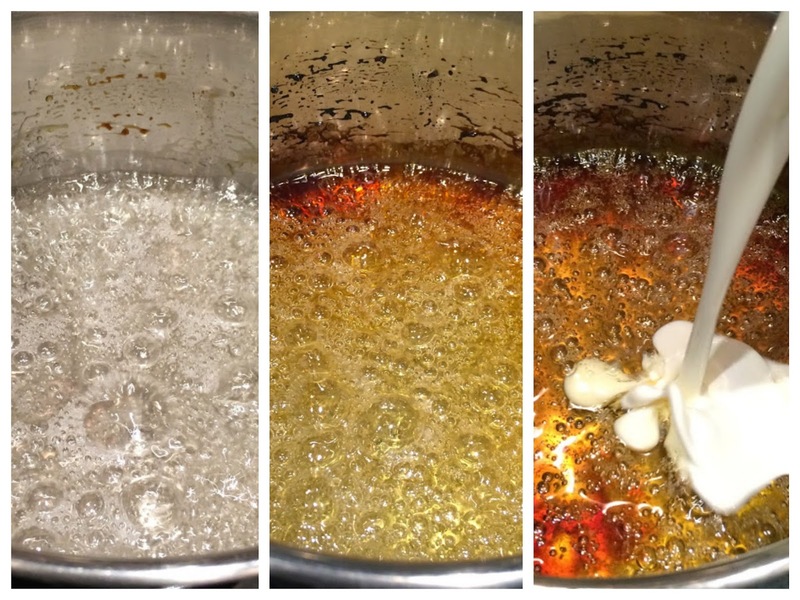 Turn off the heat at 360F or 180C as the temperature of the caramel will continue to rise. 6. Remove from heat and very very carefully pour the cream really really slowly (or have a buddy do it for you) as you will be furiously stirring the mixture as it bubbles vigorously and threatens to overflow the saucepan. Uh hmm... hence the medium and not the small sized..
7. Return the caramel to a low heat, stirring with a spatula until the mixture is uniform. 8. Remove from heat again and stir the butter in. 9. 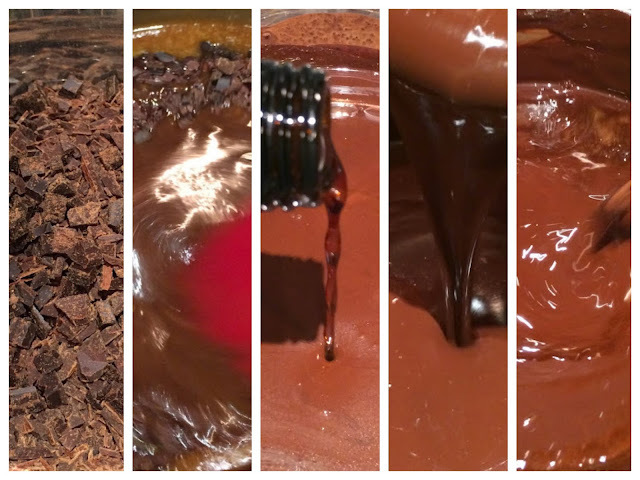 Pour this into the grated chocolate bowl, stirring until no lumps are visible. The mixture will be smooth and runny. 10. 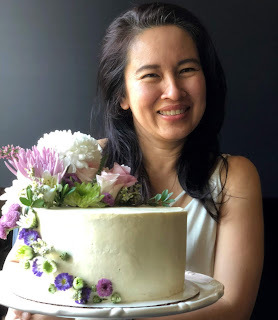 Let cool for about 1 hour them cover with plastic and set aside for 5-6 hours until it reaches a creamy consistency and it is firm enough to frost. 1. Lucky you if you have a frosting turn-platter. Use this first. 4. 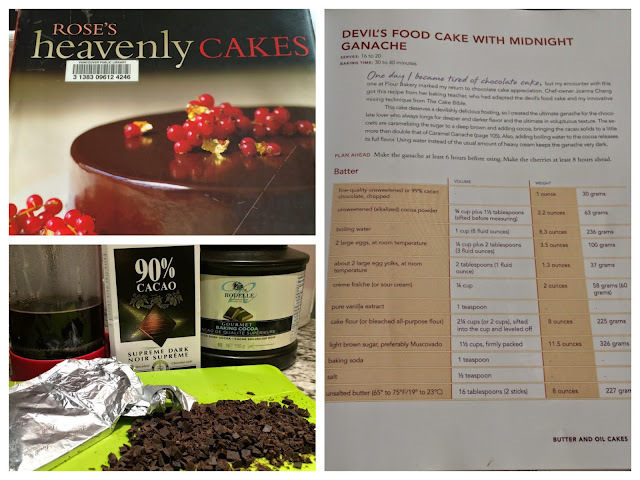 Level your cakes and start sandwiching the ganache. It should be a spreadable consistency, instead of a pourable one. 5. After covering the sides, fill the remaining ganache in a piping bag and decorate the top. 6. Ideally, refrigerate to set about 4-6 hours, covered. 7. Remove an hour prior to serving. 8. Decide which of your pretty cake pedestals deserve this decadent cake. Transfer carefully. 9. Wait for your well deserved complements.